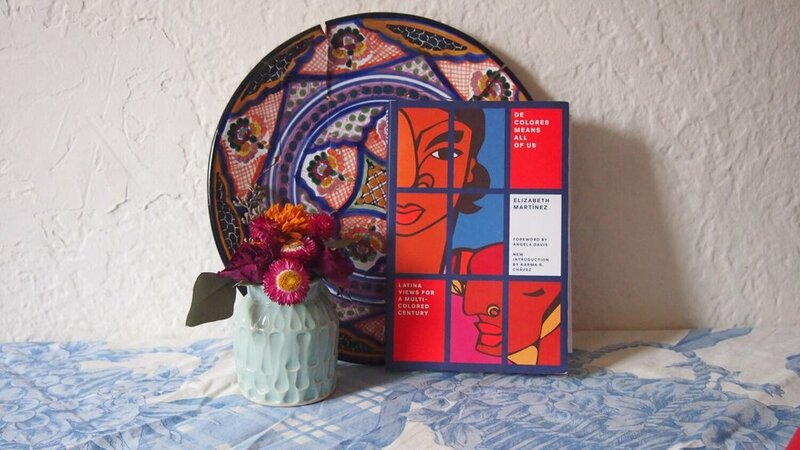 Decolores Means All of Us by Elizabeth Martínez was first published in 1998, during a period of stifling political stagnation in the US. At the time, the dramatic twentieth century struggle between competing ideas for what the future would look like appeared concluded. Fascism, the Anglo-European desire to exterminate millions of subjected humans with advanced industrial machinery, had been spit roasted between the bayonets of the US and Soviet powers and dumped into compost pile of history. Socialism (or communism depending on who you ask), on the other hand, the idea of international human cooperation, mutual respect across social differences, and emancipation from the brutal necessity of wage labor and artificially imposed poverty, fared little better. Industrial backwardness, unrelenting civil power struggles, and constant military pressure from the remaining capitalist countries led by the US produced the iron dictatorships of the East many now associate with the term communism. After the Soviet Union finally dissolved in 1989, it appeared that the US, with its “Liberal Democracy,” was the ordained victor of history. Left with no further obstacles, the leaders of our settled capitalist world wasted little time in consolidating the so-called “end of history,” and got on with the tasks of globalizing the market, subjecting all humankind to the iron laws of profit, vastly expanding the military budget, and generally getting rich off the work of others. Many on the Left gave up on the idea of changing the world, while those on the Right were busy reveling in the realization of their victory. In many respects the 90s appears in hindsight as a lost decade, symbolized by a small, bitter, infighting Left overwhelmed by the “collapse of communism,” and the fusion of the right-wing agenda with the popularity of the Democratic party in a national leader like Bill Clinton. All, however, was not lost. Compelled by the violence experienced by racialized people in a triumphant US, and inspired by the unrelenting fight against this system, many veteran grassroots organizers and a new generation of youth continued undaunted in the fight for liberation. Elizabeth Martínez was one such veteran (of the SNCC generation)—a bright light exposing other bright lights in a very dark night. Though published nearly twenty years ago, the new Verso reprint of De Colores Means All of Us contains many urgent messages for the current moment. Part history and part philosophy, De Colores Mean All of Us is a vital key to untangling the messy social structures of race, class, and gender in a specifically Borderlander US context. For the Raza, Latinx, or general Borderlander reader, from the very beginning of the book, you may be confronted with the paranoid experience of having your mind and everyday life read. For instance, Martínez opens by tackling a question that continues to provoke passionate and seemingly never-ending argument up to the contemporary moment thanks to the X in Latinx: the terminology question. Is it Chicano/a? Latino/a? Mexican American? Hispanic? Though obviously written before the Latinx debate, Martínez’s contribution on the general matter remains in many ways more productive and relevant than much of the sound and fury that clogs comment sections on the issue today. From here Martínez opens out into a much broader historical conversation on the (still) prevalent understanding of race in the US as being a matter of Black and White. This bi-polar model, as Martínez argues, not only obscures the multitude of other racial identities undergirding the US, it also propagates a dualistic moral understanding that sees things as either one thing or the other (in other words, as the colonial europeans who founded this model saw things, “the civilized vs. the savage”). Such either/or thinking has accompanied mass genocides for as long as such things were possible. Furthermore, as the world changes, so too must our understanding of race. As Martínez puts it so elegantly: “For a group of Korean restaurant entrepreneurs to hire Mexican cooks to prepare Chinese dishes for mainly African-American customers, as happened in Houston, Texas, has ceased to be unusual.” If the idea is to dismantle the hierarchy atop which Whiteness sits, then naturally part of this process must be producing our own accurate understanding of how this hierarchy functions, with all of the racial complexities confronting us today incorporated. Martínez then changes tack to focus on the making invisible of the Latinx experience in the US. Beginning with a personal recollection of a confrontation she had with a White “Lion of the Left” (an academic) over the topic of Latinx activism in the sixties and his denial of such a thing, Martínez moves onto an extremely helpful historical takedown of the racist lies that pass for state level education in places like California and Texas. Though the specific textbooks she is referencing may now be obsolete, pretty much anyone raised and educated in the border states will likely find the arguments they make (which Martínez dissects) to be completely in line with what we were taught. From the “brave defenders of the Alamo” schtick (among the most famous of whom were an escaped murderer, William Travis, a slave runner, James Bowie, and a gunfighting adventurer, Davy Crockett), to the defense of US provocation of the war with Mexico, and our subsequent violations of the Treaty of Guadalupe Hidalgo, Martínez exposes the Eurocentrism of our historical education step-by-step. Though every section in this book deserves in-depth exploration, such work is beyond the scope of this review. Some concluding highlights will serve as a placeholder for the later, more sustained work of others. Martínez’s work leaps out of the page most strikingly when covering the 90’s higher-ed culture wars for or against multiculturalism (in a more immanent way than the recent work of someone like Angela Nagle in All Normies Must Die), and gets extra fresh in dedicating thought to things still emerging twenty years later, like indigenisma, decolonial thought, and xicanisma in part five. Furthermore, Martínez not only manages to avoid the, at times, laughably Anglo-male-centric aphorisms of much “hot new radical philosophy,” she also manages to avoid the smug contempt that identity-exclusive thinkers often times take on when dismissing such subject matter. As such, her more theoretical contributions to the question of politics in part six possess a novelty and insight that is uniquely important today. Overall, De Colores Means All of Us is a rare book. Neither conventionally “academic” nor “journalistic,” Martínez is able to dish out devastating criticisms of both minute and larger issues with a comedic simplicity. Moreover, the time lag of the publication, as it is a re-issue of a book from the nineties, allows the reader a sense of historical continuity. The struggles of yesterday are both prologue and content of the struggles today and—as always—la lucha continúa. Where the book does show its age is undoubtedly in section three in which the author will likely lose most readers in the minutia of acronym-activism which has since fizzled out, but even here there are many lessons to be mined from the legal labyrinth of abajo non-profits, even if their obsoletion is writ large today by the Trump administration. Whether a working adult with a desire for liberatory self-education, a student seeking decolonial alternatives to a Eurocentric academic workload, or a humanities professor putting together a critical syllabus, De Colores Means All of Us has a lot to offer.